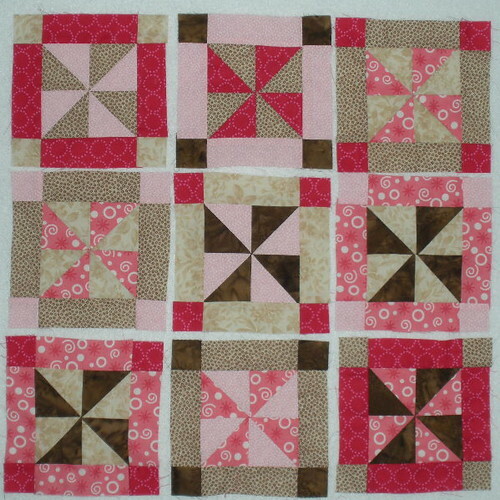 In August, we’ll be making six inch Framed Pinwheel blocks from unique combinations from 2 cherry (pink) fabrics + 2 chocolate (tan or brown) fabrics. You can make the maximum of 8 (unique) blocks using 6 fabrics: 3 pink and 3 tan/brown. You can actually make 9 combinations. 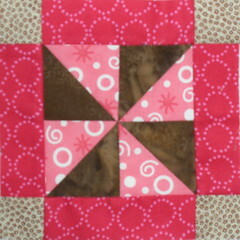 Instead of using scraps this month, I decided to use a small set of fabrics to make my blocks to see how it could be done. 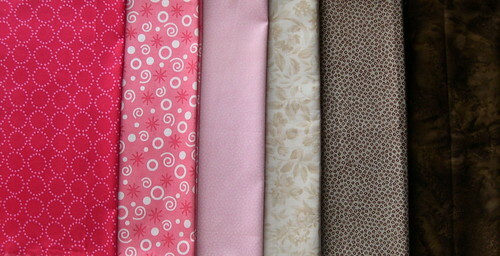 Here are the six fabrics I chose to use. If you go this route, remember to choose a set of fabrics will have good contrast with each of the other fabrics because they will all end up being combined with one another. I used the chart and made these blocks–each block has a unique combination of 4 fabrics . . . always 2 pinks and 2 chocolates.